Le Butcherettes came to Dallas last night to kick off the city’s SXSW hangover festival, Spillover. Club Dada was 3/4’s full when I arrived at 10:15 for the Butcherettes 10:30 set. An underwhelming crowd size, but an enthusiastic crowd nonetheless, Dallas certainly showed their love and admiration for front-woman Teri Gender Bender and her band. Playing Dallas for the second time in nine months, Le Butcherettes brought their typical A-Game to the festival, demonstrating yet again what makes them among the most compelling live acts around. Teri Gender Bender alternates between keyboards and guitars while singing like a woman unhinged, possessed, and flirting with danger. Banging her head, whipping her hair, writhing on her back on the stage floor, Teri can be anywhere at anytime during a live set. How she does this all and sing never ceases to amaze me. Sometimes her stage theatrics receive more press than her incredible singing voice, which is a damn shame. But, hell, what can I say? She’s so captivating it’s hard not to get caught up in her presence alone and the constant threat of unpredictability. That said, her band members are no slouches, particularly drummer Chris Common. Common relentlessly keeps up with Gender Bender’s ebbs and flows, somehow holding the whole thing together alongside bassist Riko Rodríguez-López . Playing a set that was largely made up of material from their latest album, A Raw Youth, with a mix of songs from Cry is For the Flies, Le Butcherettes had their foot on the gas from the first song to last. My only complaint is that they didn’t play longer. Being the headlining act, I expected at least an hour long set. Unfortunately the band only played for a little more than 45-minutes. This fact is somewhat bewildering. For the life of me I can’t figure out why they didn’t play a longer set. The club could have sold more drinks, the band could have won over some new fans, and the Spillover Festival could have opened their three-day event with something truly great. Considering we last saw the band opening for the Melvins with a 45-minute set, a full-fledged headlining set from the band is long overdue. Watching Le Butcherettes it’s hard not to get the feeling you’re witnessing something great, like what it must’ve been like to see Patti Smith play a small club in the mid 70s or maybe The Cramps in their prime. Confident, powerful, merciless, Le Butcherettes are the band to see in our book. Their incomparable and daring live performance reminds you of the whole reason you went out to see live music in the first place. 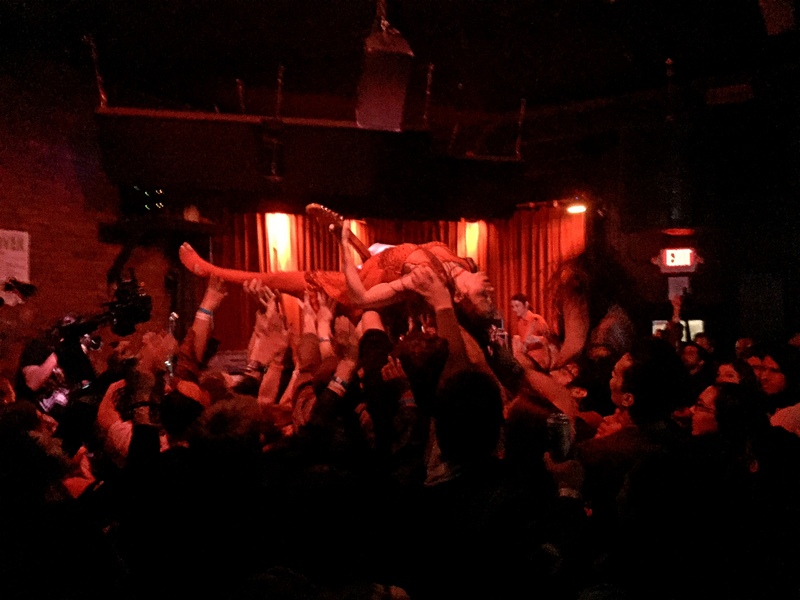 A rush of adrenalin, to be witness to something previously unseen; whatever your motivation, Le Butcherettes deliver. Le Butcherettes have more dates on their current live run and I implore you to check them out. There’s only one word that comes to mind for describing their live show: mesmerizing.